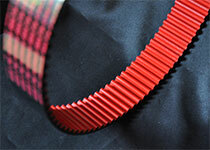 Cords for direct bonding to polyurethane are available. These are particularly good for reinforcing small PU belts for office goods such as ink-jet printers, scanners and photo-copiers. These cords are also capable of reinforcing large goods such as PU or PVC conveyor belts.